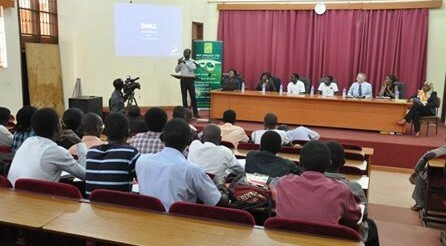 Rungi Ltd and NFT Consult Uganda (who manage Makere University’s Career Development Centre) organized and facilitated a career talk on ‘How to stand out and Excel in your career’ at Makerere University. Ayodeji Alaka, in collaboration with Archie Waters (an organisational psychologist) with Performance Through People International UK, were asked to stand in for a colleague for Ramesh Vala OBE with whom we were in Uganda as part of a UKTI and London Chamber of Commerce and Industry Trade Mission. We explored a human-centered approach to improving public service delivery for specific demographic within Kampala considering some real life capacity and resource challenges. The students’ varied background as informed users of public goods in Kampala was beneficial in terms of they explored specific issues and challenges from a knowing perspective. Activities included tools and methods of empathy: walk in shoes of user-community, mock observational interviews with “users of anticipated public goods”, internal talk from and interview with architects technologist, humanities students and engineers about analogous spaces, and ideation exercises. The students left with a better understanding of ways to collaborate creatively, hopefully with a view to resolving hard to define and solve issues impacting their ability to develop new services.